Following a successful pilot study using stationary bioaerosol sampling to detect avian influenza virus in Hanoi’s largest live bird market (link here), the research partnership of National Institute of Veterinary Research (NIVR), Hanoi University of Public Health (HUPH), International Livestock Research Institute (ILRI) and Duke One Health Team (USA, China and Singapore) are expanding the use of this method to conduct a new, more comprehensive avian influenza virus surveillance study in Vietnam’s border provinces near China. 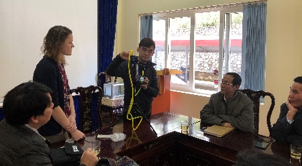 In this new study, air samples will be taken in six of the largest live bird markets in three provinces which share border areas with China (Lao Cai, Lang Son and Quang Ninh Provinces), and continue sampling in Ha Vi wholesale live bird market in Hanoi. Using a One Health approach, field teams will collect specimens from poultry, poultry cages, live bird market air, and poultry workers’ noses. 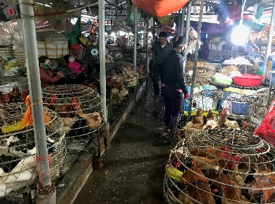 Planned sampling from poultry, the live bird market environment, and humans is supported by sellers and local partners as the sampling is largely non-invasive. 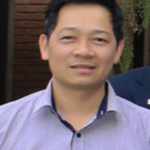 This is important in the current discussion on animal welfare and medical research ethics in Vietnam. From 8-15 January 2019, the research team conducted site visits in three border provinces and discussed the study with the staff of the Sub-Department of Animal Health and Livestock staff who expressed their strong support and partnership in this One Health project. This study will provide important information regarding avian influenza virus ecology and potential risk to humans.